Sales has never been an easy profession, but our research shows that more salespeople than ever are struggling to make their numbers. Over the last five years, the percentage of salespeople making quota dropped by 10 points. The percentage of companies achieving revenue also dropped by nearly 4 points. If you’re in senior leadership, this performance decline can be incredibly frustrating. You’ve invested hundreds of thousands of dollars, if not millions, in CRM solutions and other technologies designed to make your salespeople more productive and effective. You’ve put considerable funding into developing training programs and sales collateral. You’ve honed your hiring practices and sought to attract top-notch talent with a proven rack record in your industry. So why aren’t you seeing a return on your investment? Our answer is simple. Today’s sales organizations are not keeping up with and adapting to the pace of change. We all know how quickly things change. Just think about what you can do with the phone you use today as compared to the one you used just five years ago. From the technology itself to the apps that are available, the difference is night and day. However, few of us take the time to think about the macro forces of change all around us and how they impact the profession we’re in. We’re not talking about the small things like the release of the latest iPhone. Or even more dramatic events like an economic recession that can have a real, but often temporary, impact on our opportunities. Instead, we’re talking about the really big changes that irrevocably reshape the world we live in and how we sell. To understand this, we need to start with five important macro-level changes. You’ll probably be familiar with each of these to some extent, but what we want to look at is how they are impacting the sales profession. Digital first: disruption and consumption. The release of the latest smartphone technology certainly falls into this category, but it is much broader than that. McKinsey estimates that the Internet of Things has the potential to impact the global economy by as much as $11 trillion by 2025. This impact will be the result of changes in the way businesses collect and leverage data for better decision-making and the way consumers use technology to interact with sellers. As sales becomes more technologically driven, desirable skill sets will shift from strictly soft skills like relationship-building to include harder skills like data analysis. In some cases, the best candidates may not even come from the field of sales. Emerging middle class. 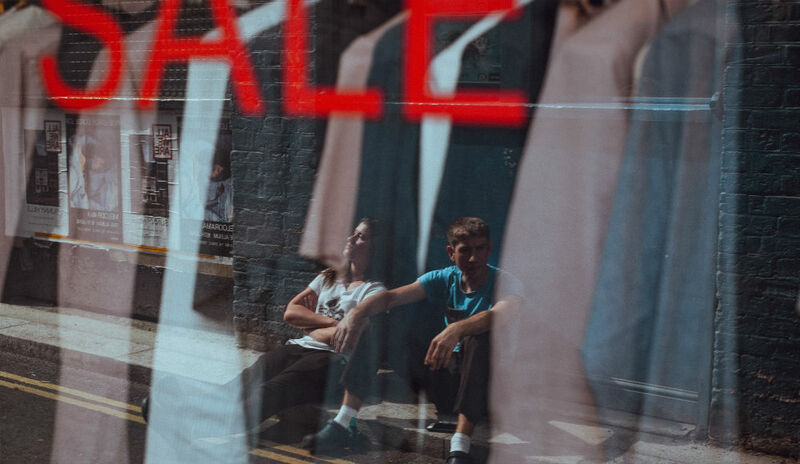 In the developed world, the number of people with middle-class buying power has remained relatively stagnant and, in some cases, has even declined. However, in many emerging economies, the opposite is true. By 2025, the middle class is expected to have increased by 153 percent around the world, with the greatest increases coming from countries in the Asia-Pacific region. To tap into this new buying power, companies are going to have to staff a sales force with professionals from countries and cultures that may be very different from those of their current sales force. These new hires will have unique enablement needs. Increased urbanization. Many geographies are also moving from primarily agrarian-based economies to heavily industrialized economies supported by growing cities. As many as 65 million people are moving to cities every year. That’s the equivalent of adding seven new Chicagos (including surrounding suburbs), five-and-a-half new cities the size of the Paris metro area, or almost two new cities to rival Shanghai every year! What were once small urban areas will grow into commerce power centers as people and industry flock to these cities in the hope of new opportunities and an improved lifestyle. Companies will need to adapt both their market and go-to-customer strategies to adapt to new opportunities and new competitors that are sure to emerge. Productivity and the aging workforce. In more mature markets, workers are hitting retirement age faster than they can be replaced with new recruits. The labor market for the last 50 years has seen a steady growth of around 1.7 percent, but McKinsey predicts it will drop to just 0.3 percent over the next 50 years in its report “Global Growth: Can Productivity Save the Day in an Aging World?” For businesses, this translates into more competition for an ever-smaller pool of qualified talent. To be successful, companies will need to get better at attracting younger talent and profiling new hires. Once talent is hired, enablement will need to onboard these new recruits as quickly as possible and provide the services necessary to drive sales professionals to higher and higher levels of productivity. Invisible sector boundaries. The ability to redefine your industry has long been a recognizable principle of business survival. If you took any business classes at all, you probably remember the buggy whip manufacturer example or how railroad companies went out of business because they saw themselves as being in the railroad business and not the broader transportation market. Some of the most successful businesses today are masters at crossing sector boundaries. Ten years ago, Amazon just sold books. Today, the retail giant is successfully chipping away at established retail and logistics businesses across a range of sectors. For sellers, the competitive landscape shifts like the sands of the Sahara. Salespeople will need to get better at crossing these boundaries, selling into new markets and competing against companies that they never imagined would enter their space. It’s not just the macro forces that are impacting our ability to sell. There are a number of micro forces at work as well. If you’re in sales, you probably have stories you could tell in each of these categories, but our research puts some statistics behind the changes you see every day. More buyers involved. In complex B2B sales, facing a team of buyers is nothing new, but over the years, the size of that team has been steadily growing. Our 2018 research shows the number of buyers on the average buying team has risen to 6.4. Our clients also tell us that these teams are made up of buyers from a wider range of disciplines as well. Salespeople will need to get better at managing a larger number of buyers and identifying their unique challenges, wins, and ideas for how to achieve their personal and business objectives. Increasingly formalized process. As the size of the buying team increases, businesses tend to follow a more formalized process. This is one of the reasons we will focus so much on the path the customer follows to make decisions and implement solutions throughout the rest of this book. Political and business-driven decisions. Increasing the number of people on the team almost always increases the amount of politics involved as interrelationship dynamics become more complex. Teams are also focused more on the business aspects of the decision, and the percentage of customers requiring an ROI analysis has gone from a five-year average of 40 to 61 percent in 2016. Evolving buyer expectations and needs. Today’s buyers have greater access to information than ever before, but while that may mean they are much more informed when they engage sales, it doesn’t always mean they are better informed. Furthermore, buyers are not so much interested in what a product, service, or solution is as in what it does. They want to know how it will help them solve their challenges or reach a business goal. That requires a very different selling approach that translates capabilities into business value. This need cannot be met by adding a little bit of customer-centric color to an otherwise product-centric approach. Longer sales cycles. The “CSO Insights 2017 World-Class Sales Practices Study” found that 60 percent of sales cycles with new customers lasted over six months. That’s up from 41 percent just a year ago. This is reflective of other trends, such as larger buying teams, as well as the increasing sophistication of the solutions sold. While sales enablement can sometimes help shorten sales cycles, in general, salespeople and organizations will need to learn to adapt their approach to these longer selling cycles. The changing needs of today’s buyers and the downward slide in sales performance have led to an increased focus on sales enablement in many organizations. In 2013, only 19 percent of companies we studied had a dedicated enablement person, program, or function. In 2017, that rose to 59 percent. How successful sales enablement is makes a huge difference. 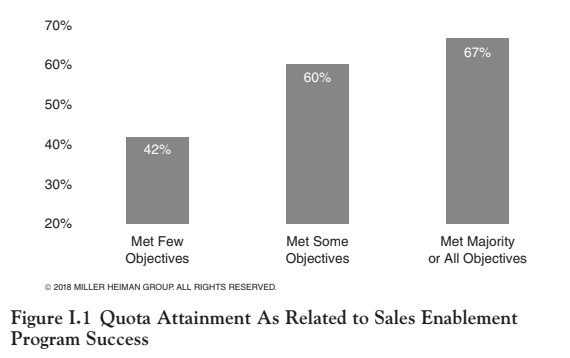 In our most recent study, only 35 percent of organizations reported that their enablement discipline met or exceeded expectations, but within this group, 67 percent of salespeople achieved quota (see Figure I.1). Organizations that reported meeting only some of their enablement expectations saw 60 percent of salespeople achieving quota. Organizations that reported achieving few of their expectations, essentially failing to enable their sales force, saw only 42 percent of their salespeople achieving quota. Quota attainment in this final group was even lower than the study’s average quota attainment of 58 percent. 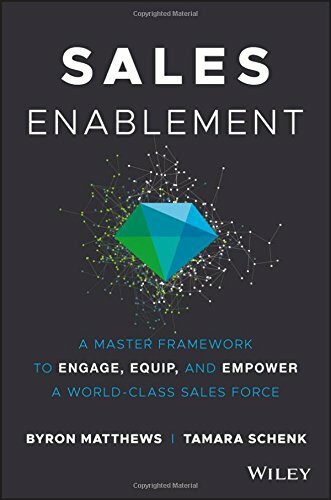 - There is very little agreement (even within organizations) on what exactly sales enablement is, what it does and how to create an effective discipline. - Even when there is agreement within the organization, most sales enablement initiatives are shaped around vague and unclear outcomes. - Most sales enablement initiatives are not designed to help salespeople adapt to the micro and macro forces in the marketplace. This is a direct excerpt from Sales Enablement: A Master Framework to Engage, Equip and Empower a World-Class Sales Force by Byron Matthews and Tamara Schenk, copyright © 2018 by Miller Heiman Group. All rights reserved. Published by John Wiley & Sons, Inc., Hoboken, New Jersey. Published simultaneously in Canada. Byron Matthews is chief executive officer of Miller Heiman Group. Byron not only brings the senior leader’s perspective to the topic of selling, he also has a long and successful track record in sales himself with major companies, including Aflac, Mercer, and Accenture. In the industry, he is a sought-after speaker on topics such as AI-augmented sales and the future of selling. Tamara Schenk is research director at CSO Insights. In addition to being the lead analyst for sales force enablement at CSO Insights, Tamara is a noted author, speaker, and evangelist on the topic. She also brings real-world enablement experience to the table, having come up through the enablement ranks to serve as VP of sales enablement for T-Systems, a leading global IT and telecom company, before joining Miller Heiman Group. Byron Matthews is chief executive officer of Miller Heiman Group. Tamara Schenk is research director for CSO Insights.